de Grisogono, having endured through the dark days of trying to sort out their various investor issues, have just launched a playful new collection of novelty watches that are sure to light up the night. The Tondo by Night collection literally lights up from the inside, using special condensed light from the material of the case and buckle known as “Pearly Photo-luminescent Fibreglass”, a concept exclusive to de Grisogono and accented with mother-of-pearl particles. The colours shine and highlight the precious stones that surround the winding mechanism of the watch. The effect is both magical and luxurious, as the stones sparkle and glitter in the pearlescent illumination. The grain of the stones echoes the grain of the “galuchat” stingray hide from which the strap of the Tondo by Night is crafted. When night falls, the show really begins. Rather like Andy Warhol’s 15 minutes of fame, the watch stores energy when exposed to just 15 minutes of either natural or artificial light. Once charged, Tondo by Night comes alive in a blaze of exotic colours, as well as lines that are re-sculpted by the sparkling luminescence. 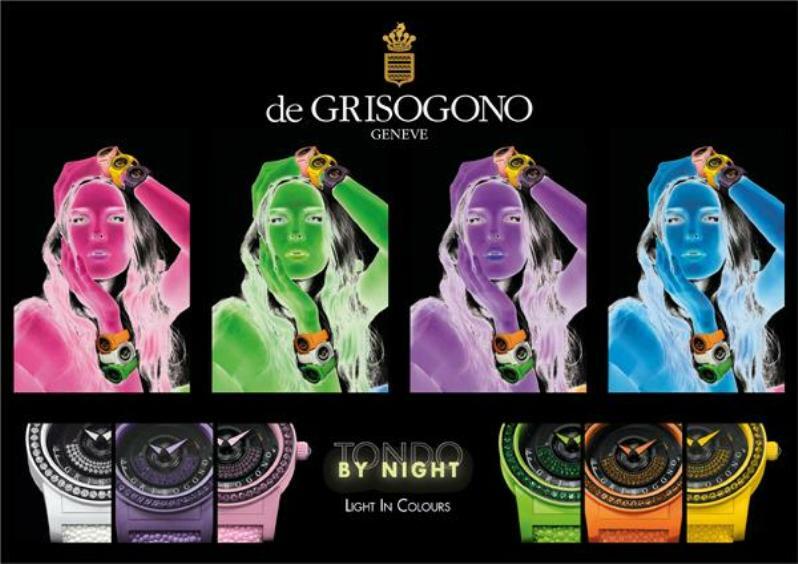 The ultimate clubbing watch, Tondo by Night continues to glow even when the projectors are switched off. Available in a variety of bright colours, the Tondo by Night dial is set with 60 precious gemstones including purple amethysts, yellow sapphires, green favourites, pink sapphires, orange sapphires or white diamonds.